Preheat the oven to 175 degree C or 325 degree F. Take an 8 inch round springform cake tin. Place a large 8-inch by 8-inch square of baking parchment on a flat surface. Place the springform pan in the middle of the parchment. Gently fold up the sides of the parchment around the pan. Make sure to do this gently. Press the paper around the edges of the pan. On another sheet, draw an outline of the tin. Now cut out the circle and place it inside the tin. Grease it with some butter and sprinkle some flour on it. 1) Grate the rind of the orange and the cut the orange in half and squeeze out the juice. Keep the juice aside for later. 2) Put the butter into a large mixing bowl and beat it until it is soft and smooth in texture. Beat in sugar and the orange rind, until the mixture is fluffy and light. 3) Crack the eggs in another small bowl and beat them well. Pour them little by little into the large mixing bowl. Beat the mixture well after each addition. 4) Take the cocoa powder in another small bowl and add 2 Tbsp. warm water to it. Mix it well and add this mixture to the rest and stir it in. 5) Sift baking powder and half of the flour to the mixture and add half the yogurt to it. Fold it gently. Add the cherries and fold them in too. 6) Sift the remaining flour into the bowl and add any bran that was left out while sifting. Now add the rest of yogurt and fold gently. 7) Add orange juice and fold it in too. 9) Take it out and run a knife around the sides of the tin. Turn out the cake and leave it to cool. 10) For the icing, make sure the butter is softened. Mix the ingredients together until smooth. Pour into the piping for design or simply spread it over the cake and smooth it gently around the edges. Sprinkle some tutti-fruiti over it or decorate it with lovely large sour cherries. New recipe in my kitchen! – Mushroom Matar Masala. The cloudy, gray and rainy weather plays a truant on my mood and makes me alternatively lazy and irritated. Writing for leisure has taken a back seat with work deadlines clogging my schedule. In fact, a lot of things have taken a backseat come to think of it! Cooking has been minimal since the last few weeks. Not that I don’t like cooking or that I don’t cook at all. One must eat to survive, thus basic fare is cooked every day. However, there was the factor that I couldn’t find anything new I’d like to cook. 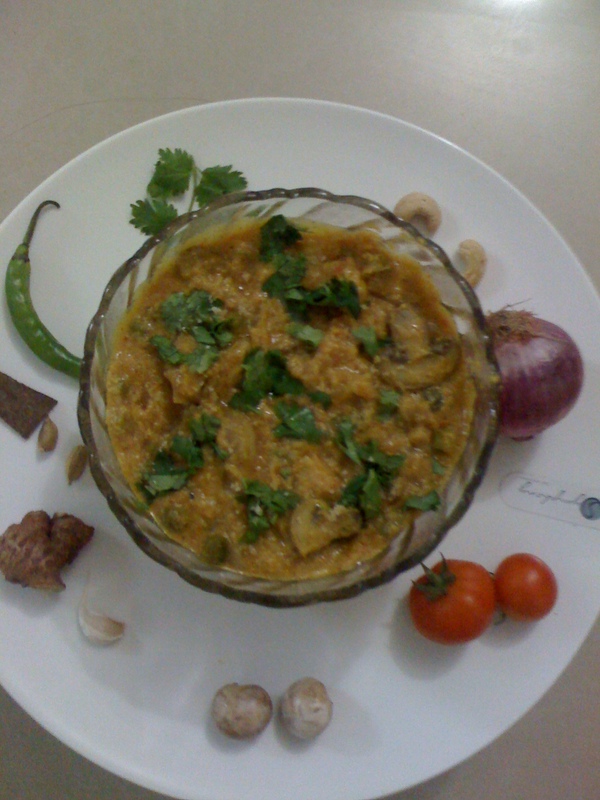 So this evening, on my stove bubbles the dish called MUSHROOM MATAR MASALA. Normally mushrooms don’t enter my house much, since Bangalore is a rainy place and there’s a chance mushrooms may perish quickly. Today however, I’m all prepared. So here goes something that I learnt from my neighbour yesterday. Essentially this recipe is easy to make and contains spicy onion tomato gravy. This dish is not hot by nature since it is calmed by creamy cashew paste. This dish can be served with Indian breads of all kinds as well as rice. NOTE: CALORIE CONSCIOUS PEOPLE ALERT!!! THIS IS HIGH CALORIE RECIPE!! 1) Once you’re done with chopping, grinding and readying the vegetables for the dish, heat the oil in a pan. 2) When you feel it’s hot enough, add cumin seeds. Once the cumin seeds start popping, add cardamoms, cinnamon stick and chopped onions. 3) Saute the onions till golden brown. Now add into it the ginger garlic paste and stir. Cook for about 2 minutes on medium flame. 4) Into it, add the tomato puree now & stir. Mix red chilli powder, coriander seeds powder, turmeric powder, garam masala and salt to taste. Stir again and let it cook until the oil starts accumulating on the sides of the spicy gravy you’ve cooked. 5) Dissolve the cashew nut paste into about a cup of water and stir. Mix it well. Now add this paste to the gravy. 6) Add another 1/2 cup of water and stir. Bring it to a boil now. 7) It is time to add green peas and mushrooms now. Let them simmer in the gravy for about 7-10 minutes. The peas should be properly cooked. 8) Garnish it with chopped green coriander before you serve. Western India includes Rajasthan, Gujarat and Maharashtra. While I’ve had some amazing food from Maharashtra, I’m not too big a fan of Rajasthani food (mainly because it’s too hot). However one region I find that has an amalgamation of lots of cultures is Gujarat. Here one can find hot, spicy, sweet, sour and even bitter tasting food eaten with relish. Here are two recipes I decided to try my hand at yesterday. While the first is a healthy dal mixed with a bit of green and can be eaten with any kind of bread or rice, the second is a flat bread. You could eat it any time when you’re feeling a bit peckish– tea-time, for lunch with curries and other veggies, you could spread some jam or butter over it and eat it and so on. I remember eating this bread mostly with a bit of sugar sprinkled on top. Enjoy! Mix the Bengal gram, vegetables, coriander powder, turmeric powder and ginger in a deep pan/pressure cooker. Add ½ cup water and cook till is done. The hint of the dal being done is when you can mash it to a pulp. Do NOT use the blender to mash it, but do it gently with an egg beater. It is meant to be a thick dal but if you feel it is too thick or dry, add some water and stir it for a bit. Add salt to taste and stir. Leave it aside for the time being. In the meanwhile, heat the oil in a small pan on medium low heat. Add garlic and let it pop until it turns golden brown. Now add cumin seeds to it along with green chillies. Cover it with a lid and let it pop for about 10 seconds or so. Add onions to it and fry them till well done. Add this mixture to the resting dal and stir to blend well. Garish it with coriander leaves and serve it piping hot with Chapattis. Chop onions finely and add finely cut green chillies, small cut pieces of Zucchini & coriander leaves. Add them all to the wheat flour along with salt to taste and 5 Tbsp. oil. Mix all the content properly and add a bit of water to it from time to time as you knead the mixture. Make sure the dough is soft but not too soft. You can store this dough in the fridge for about 3 days. Take it out 30 minutes before you plan to make Koki flatbread. Divide the dough into small rounds and roll them with a bit of flour into about an inch thick round bread one by one. Take an omelette pan heat it on low flame. Place one rolled bread on to it and flip it when one side is done. Spread a bit of butter on the done side and wait for the other side to be cooked. When the other side is done as well, flip it again and spread some butter on this side too. Now take it down and place it on a plate and roll the next Koki to cook. The entire process of cooking the Koki roti takes not more than a minute once it’s rolled. Serve it with curd/ pickle/ poppadum/chutney/butter/tea/ cooked vegetables/dal, etc. Not that I’m a very good cook, but sometimes, when the mood takes me I do indulge in a bit of cooking. I don’t cook very well, I think but this time around, my hard labour bore good fruit. You see, I’ve spent the last two years learning more of Indian cooking than in all my life. 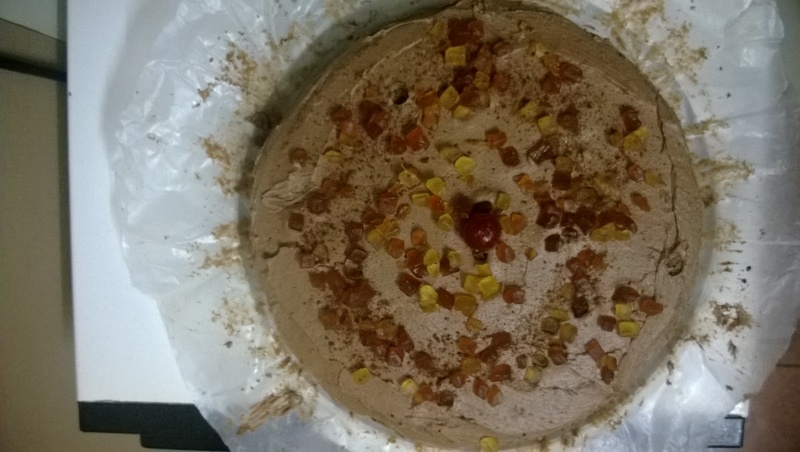 So here’s something new that I learnt a week back, and to my delight, I found that it was quite delicious! Thought I’d post the recipes out here, one by one, for Indian food enthusiasts. Mind you, it’s Indian food- not hot but surely full of fragrant and wholesome spices. I also cooked something yesterday that was purely North Indian (Punjabi) food, but that’s for later. So here goes! Put a medium saucepan on heat. First of, heat oil over medium heat. Add cumin seeds and once they start popping, add onion and carrot. Lower the heat. Stir it while it cooks and the onion becomes pink and tender. It would take about 15 minutes for it to start looking golden brown on low heat. Add garlic cloves and ginger; cook 2 minutes. The heat now should be on medium. Now add Basmati rice to it. Stir it so that the rice is coated with the cooked mixture. Add water and salt. Bring to a boil once and then reduce heat and let it simmer. Cover it with a lid and cook until rice is tender. It should take about 20 minutes for the rice to be cooked. You need to check in between to make sure the rice is not dry. If it dries and is not yet cooked, add a little more water. If you are cooking in a pressure cooker, close the lid after adding the rice and stirring it once. Give it one whistle and turn off the heat to let it cool. Onion rice is ready! Wash mustard leaves properly so that there’s no more mud on any of the leaves ( much like you wash lettuce) Let water run through it twice and then strain them in a colander. Cut the leaves in thick long pieces and cook them in a pressure cooker or deep bottom pan with one cup of water. If you’re using the pressure cooker, give it one whistle. If using a pan, cook until the leaves are soft. Drain excess water, cool them and grind them. Let them remain a bit coarse after they’ve been ground. Set the bowl aside. Make a paste of tomatoes, green chillies and ginger. Pour some oil in a frying pan, adding Asafetida and cumin seeds to it when it’s just starting to heat. Let it roast for about 30-40 seconds. Then add turmeric powder along with corn meal flour and stir. After about a minute, add the paste made of tomatoes, green chillies (optional) and ginger. Add red chilli powder to it and cook it until oil starts separating from the paste. Those who like it a bit hot can add 1 chopped onion and two cloves of garlic to the paste. When you see the oil separating from the cooked paste, add one glass of water and salt. Now add mustard leaves and stir it well so that everything is nicely mixed together. Cook it on low flame once you see the water evaporating completely for about 5-6 minutes. While serving, garnish it with home-made butter or fresh cream with a sprig of coriander on the top. 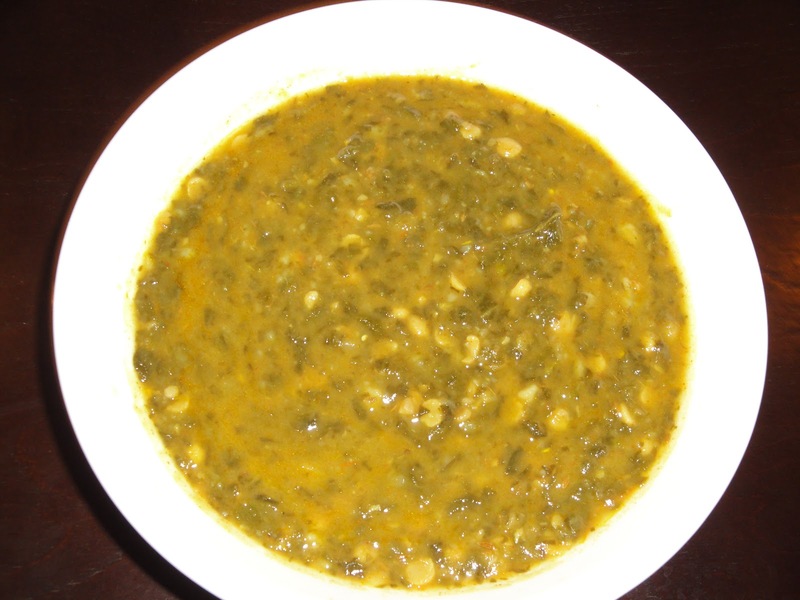 Sarson ka Saag is ready!